One of the things everyone has in common is that we must all breath. Breathing in dirty, polluted air is linked with all kinds of health issues including asthma, bronchitis, and even cancer. This is why it is important to make sure that you and your loved ones are breathing in clean air that will not cause health complications in the future. Indoor air pollution is an ever growing problem in the United States. Many people have been breathing polluted air inside their own home for such a long time that they have gotten used to it and may not even realize that the air they are breathing is polluted. This is why it is important to call a company that will not only properly examine and clean your HVAC systems, but also to make sure that the services provided are only natural and organic. Here at Organic Air Duct Cleaning we are passionate about our client’s health. That is why our first step is always to provide a free consultation. The first step of this consultation is the examination and the second step is the explanation. 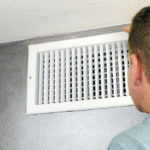 During the examination phase our clients will take a look at your HVAC systems and anything else that may need cleaning. They will determine the best products to use and services to provide for your individual situation. Afterwards they will explain to you if you wish to proceed what services they will provide and how much they will cost. This is done because every situation may be different and we would like to make sure you get the most high end, cost effective solution to your situation. Our goal is to serve our clients and facilitate their healthy living.